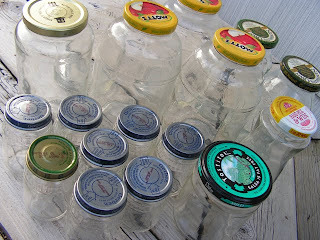 i thought it would be fun to do a repurposing challenge with jars, since they are one of my favorite things to repurpose. the whole idea of doing a challenge came about from a couple of different things... i'm a huge fan of Project Runway, where on each episode they have a different & fun challenge, you know, like the one where the contestants could use only materials from a recycling center & had to create an innovative garment. 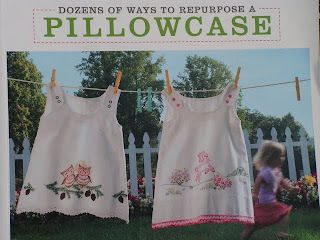 also i really enjoyed this book, Craft Challenge: Dozens of Ways to Repurpose a Pillowcase, have you seen it yet? 20 designers took the pillowcase challenge & came up with 28 (mostly sewing) craft projects. 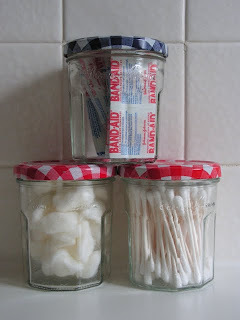 so i took this concept of a challenge, thought it would be fun to apply it to glass jars & share the results with you. 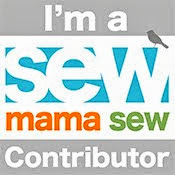 and here each weekday during November --- a total of 21 days --- i plan to share ideas on how to repurpose a glass jar. maybe you'd like to play along? i would love to see photos of your ideas & creations. i also have a request, if you've ever seen an entire book (or lengthy magazine article) on repurposing jars, please let me know, i'm curious to know if there's a book solely on this subject... thanks in advance ! so where can you get glass jars? ...make a point when you're out grocery shopping to look for & buy your food items in fun glass jars, check out: garage or yard sales, vintage or antique shops & flea markets for vintage ones, freecycle, eBay, .... looking for baby food jars? ask a friend who has a baby/toddler or ask someone who runs an in-home daycare if they happen to have any. 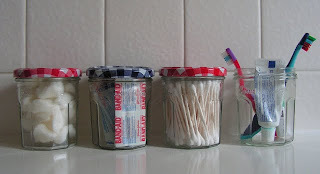 this first idea is reusing jars for storage in a bathroom & for this one i used only Bonne Maman jars, you know, the yummy French jams & jellies in the jars with the cute gingham lids ! i was just in the grocery store yesterday & saw that they had a Bonne Maman jar with a brown gingham lid, i believe it was some type of chestnut spread? so now your choices for Bonne Maman jars are: red, blue, and brown lids. 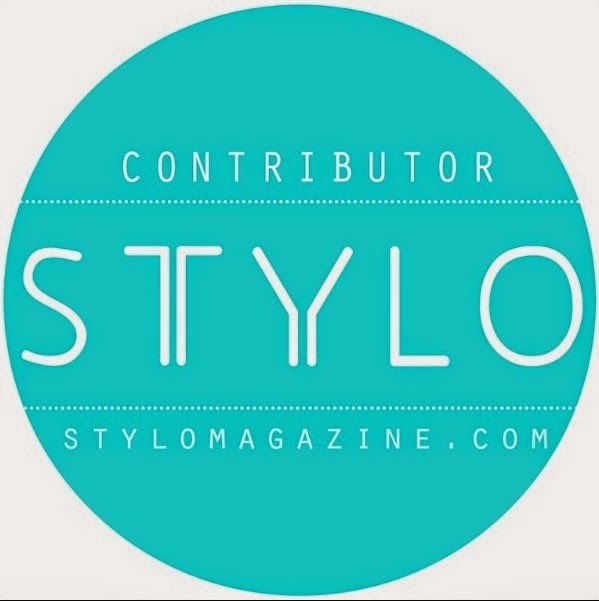 how fabulous is that !?! another thing i need to mention is that the paper labels come off very easily on these Bonne Maman jars, just soak the jars in water & the paper peels right off - no glue left on the jar! also, i didn't get a chance to make one of these myself, but this is a great idea to have by any sink, bathroom or kitchen, check out this mason jar soap dispenser how-to. see you tomorrow for day 2 ! What a great idea. It looks so good.I can hardly wait for the soap dispenser!!!! I think I also saw BM jars with a green (but not a very pretty hue of green) lids. I'll have to check that next time when I shop for food. 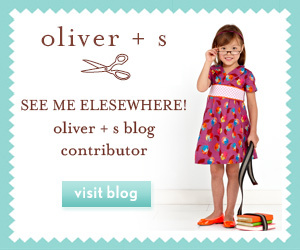 came here from nini makes. following! i can't help but buy them whenever i see them in the store. hey friend! I am always wanting to comment on your posts and can't unless I go all the way back… is there something wrong with my browser???? I hope you are doing well! 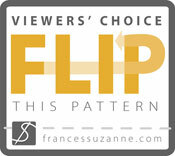 I loved your chevron dress for the last "flip"